Posted on March 16, 2008	by Linda S.
I finally made it to the public library in search of some books on spinning… I think it is a sign that spinning is not and has not been big in this area since the only two I found were printed in the ’70s. And not a soul had ever heard of naalbinding. 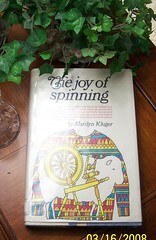 Anyway, I found these two books… “The Joy of Spinning” by Marilyn Kluger and “Handspinning..Art & Technique”by Allen Fannin. Both books refer to “oiling the scoured fleece” to replace some of the oil and lanolin taken out during the scouring process. They both suggest that by adding oil back into the fleece, it will card and spin much better and have a finer hand and softer feel… It suggests that after the spinning process is complete, the yarn be washed with hot soapy water to remove the added oil. I put the question up on one of the Yahoo groups that I am in, but so far no one has heard of this step in the process. It makes me wonder how, during the passage of time, processes change almost without notice. This entry was posted in Fiber Preparation, Naalbinding, Spindling, Spinning, Weaving. Bookmark the permalink. I think the books you mention are nearly at the ends of the spectrum, as far as technicality is concerned. I remember the Fannin book as being *very* technical, and Marilyn Kluger as being much more consumer-friendly. Good luck with spinning. Love the Bosworth – my midi is my fave spindle. Alden Amos’ book on handspinning also mentions this. He’s technical, too. I had thought “I’ll never do that!” (sounded like a hassle). But now I am drum carding an Icelandic fleece, and it’s so flyaway it’s building up on the licker-in drum, so I just mixed up a bottle of oil spray to see if that helps.